We have a group of fishing guides that work with us that you will love to spend some time with on the water! As you know, we all have different personalities but that’s what is fun about life. If you hire one or more of our guides, you will not only find good people that know fishing but you will find a character or two and some extremely talented people in many different ways. Hunters, carpenters, state troopers, factory workers, dads, grandpa’s, great grandpa’s, maybe a teacher, professional joke tellers(not me), athletes and many other talents make-up the all around people that you may share a boat with when you hire one of our guides! Just ask them :)!! And don’t be scared if your guide is the state trooper. As far as the fishing, we all have our favorite species but the bottom line is that we all just like to see people catch fish. The multi-species fishing that we have here in the lakes area is second to none! Largemouth bass, smallmouth bass, bluegill, crappie, pike, perch, walleye and musky are just some of the species that you may encounter while on a trip with us. I have been guiding since 1989. I am 49 years old as of today and I am very thankful to have been able to spend so much time hunting and fishing. I am still guiding quite a bit, but it is so nice to have an awesome wife to book all of the trips and such awesome guides that are dependable and professional to fill our many trips throughout the open water and ice seasons. Bruce is a multi-species fishing machine. He has been guiding since 2000 but has been fishing his whole life. Bruce fished tournaments for 17 years and learned many tricks of the trade during that time. A day on the water with Bruce will be a learning experience and you will also get some good laughs. Bruce has been an ambassador for Berkley from 1973 to the present. Bruce is a married man and his wife Nancy is a gem! They have grown children and numerous grandchildren, so yes he can handle kids in the boat! 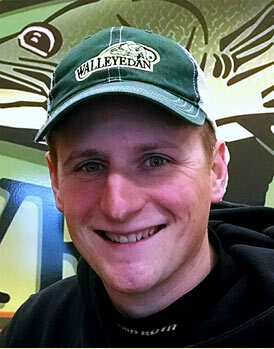 Nick is an avid outdoorsman and walleye fishing guide who grew up in the Brainerd Lake Area and still resides there. His love of being on the water is a result of growing up around it. 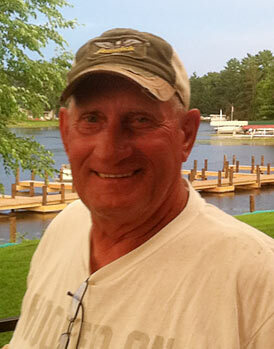 He thoroughly enjoys all of his time on the water, chasing all species of fish but has a love for walleyes. 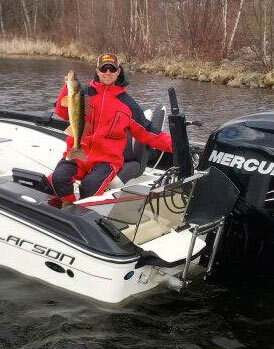 In his off time Nick works for his family business, Miltimore Motor Company, and is also and ambassador for Pure Fishing Inc. His favorite lakes include Gull, Leech, Mille Lacs, and the Whitefish Chain. Nick practices a variety of techniques to keep putting fish in the boat throughout the season. Whether it’s the fish of a lifetime or a limit of eaters his dedication ensures you of a quality trip and a memory to last. Dustin can smell where the fish are! He grew up on the banks of the Gull River, developing a love of the outdoors and fishing at an early age, with Gull Lake blocks from his home. From there he branched out to fishing as many of the Brainerd Lakes as he could, including Gull, Round, North Long, Hubert, Pelican, the Whitefish Chain and even the Mississippi River. 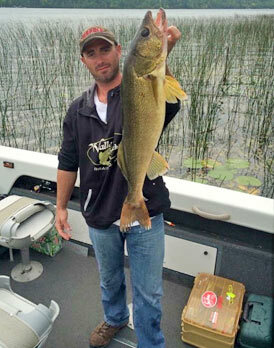 His targets include Smallmouth and Largemouth Bass, Northern, Crappie and, of course, Walleye! Dustin belongs to several fishing leagues and has won numerous awards over the years. A day on the water with Dustin as your fishing guide will bring home many happy memories, and, of course, FISH! I moved to Brainerd when I was one week old. I grew up fishing with my Dad and brother every chance I had. Now I am married with two boys who love to fish. So I can make sure kids have a good time out on the water. I fish many walleye tournaments in the area and that is the fish I target the most. I served 8 years in the military and spent 12 months over seas, so I appreciate taking other veterans out fishing and giving them a great fishing experience. I know the lakes in the area and can’t wait to put you on the fish. This gigantic lake sturgeon was caught on the Rainy River. The fish measured around 67 inches. Interested in catching one? Call us! Bruce and Nick have arrived at Madden's Resort on Gull Lake to pick up their guests for the day.